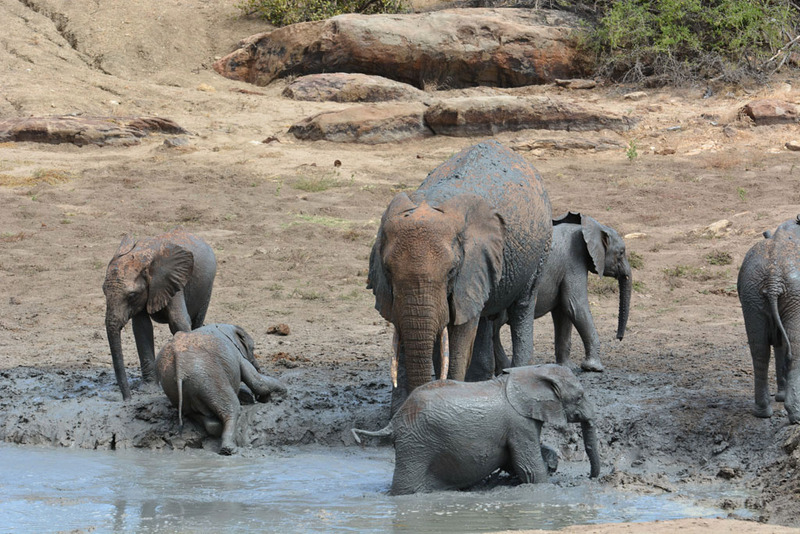 Under the blue sky of Africa in the remote, dusty and magical place of Ithumba elephants slosh in the cool mud bath. Anticipating blissful relief from the heat the babies slip and slide down the slippery bank. Ex-orphans who have given birth to their own babies bring them back to the bath and introduce them. Wild elephant herds come in to say hello to old friends and eventually take over the mud bath splashing and spraying water over each other. 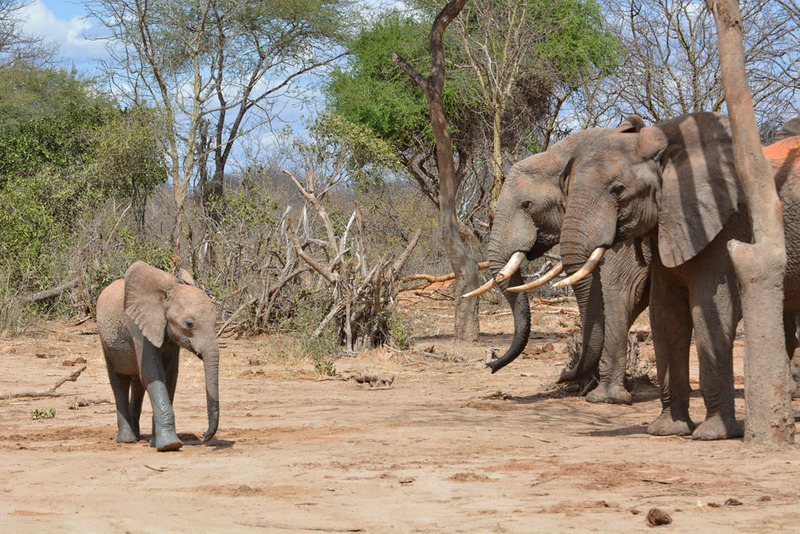 Ithumba is a rehabilitation and soft release site in Tsavo National Park for The David Sheldrick Wildlife Trust. Baby Elephants from the orphanage nursery in Nairobi transfer here or nearby Voi to continue their rehabilitation. 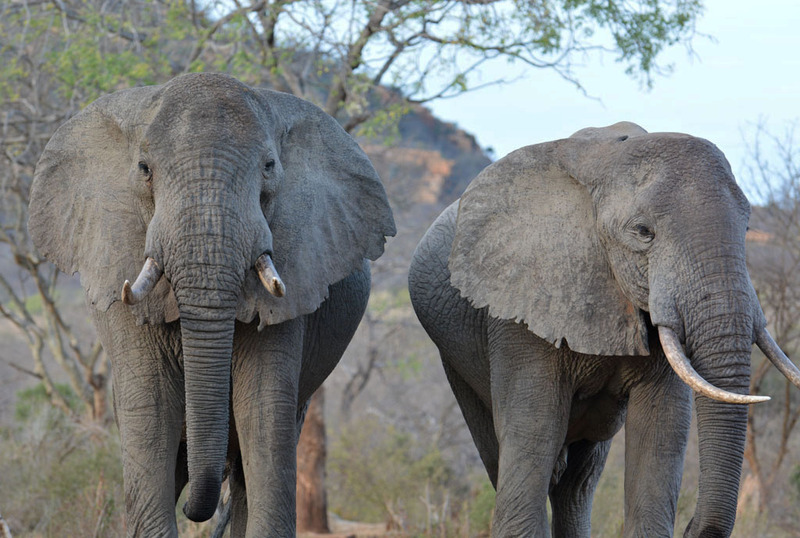 So far 150 elephants have successfully adapted back into the wild. The slow transition into the wild is done at their own pace. There is no rush and it can take up to 10 years. Sponsors of orphan elephants can visit Ithumba for an intimate insight into the daily lives of the elephants. We sponsor two babies and after visiting Ngasha one of our orphan elephants at Nairobi Orphanage we are excited to meet Kandecha our other sponsored baby who is now at Ithumba starting the next stage of his rehabilitation. At 14 months old Kandecha was spotted from the air amongst a herd of elephant bulls who were protecting him. What an amazing sight it would have been to see this tiny baby encircled by these huge bulls. Unfortunately, they could not supply him with the milk he desperately required, so a complex operation was put into place to capture him. The whereabouts of his mother remains a mystery. 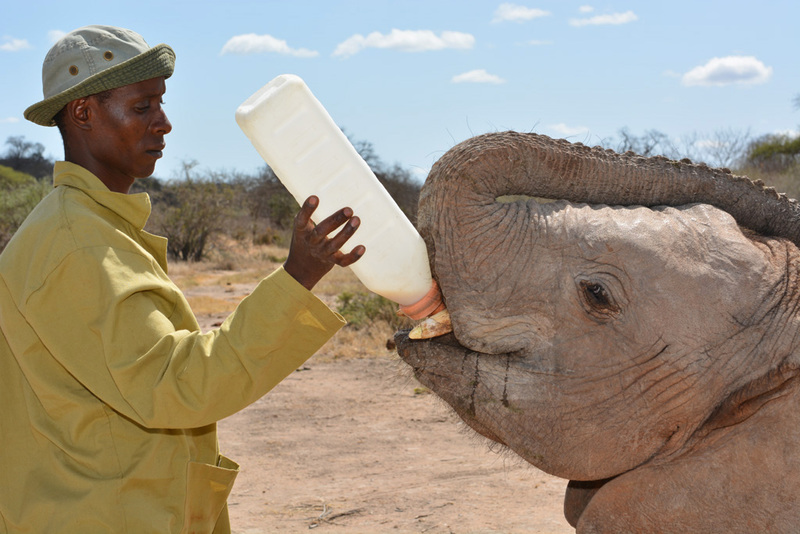 Now five years old, his days at Ithumba start with two huge milk bottles in the early morning. With friendly rivalry, he and his friends stampede out of their stable to the keepers holding the milk bottles. They greedily drink the milk and sometimes hold it themselves with their trunks! Trumpeting and rumbling they mingle with ex-orphans who come back to visit and wild elephants who come in to drink and eye off their lucerne. Later they go bush with their keepers so they can learn to find natural food and acquaint themselves with the wild. A wild elephant wants to go for a mud bath too. Routine is important and at 11 am they return from the bush and drink another two bottles of milk. After this, the fun starts and they go for a mud bath. 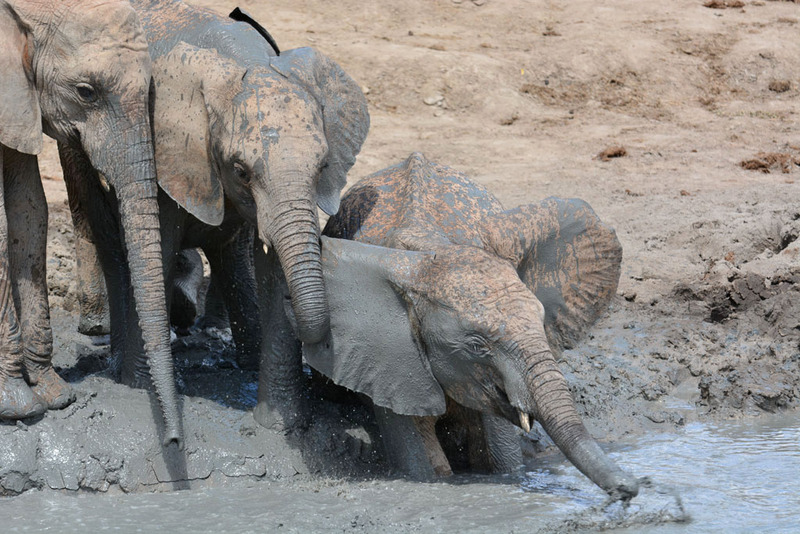 The anticipation of the mud bath as they trumpet their joy and delight as they slide down the slippery mud bank is the best part of the day. The wild elephants want their mud bath too and they enviously look at the orphans and slowly make their way close and eventually take it over. Their size is enough to intimidate the little orphans but sometimes they give them a gentle nudge and the babies scramble up the mud bath skidding and sliding back into the mud in their haste. The wild elephants like the orphans as they can go for a bath any time of the day, but they prefer to go at 11 am when the orphans bath. Known as the “elephant whisperer” Benjamin the head keeper tells us the orphans communicate with the wild elephants and let them know it is safe and OK here with the humans. After working with the elephants for over 13 years, he is a wealth of information and knows all the elephants by name and they respond to his gentle commands. We cannot praise the dedicated keepers enough for all their hard work, sometimes working with the elephants 24 hours a day. 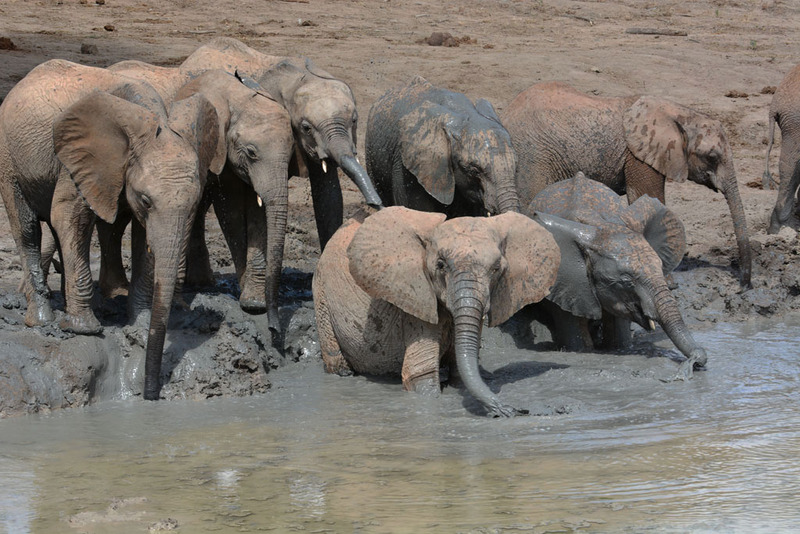 The wild elephants of Tsavo take over the mud bath. After their mud bath, the orphans spend the rest of the afternoon back in the bush with their keepers until late afternoon. They drink another two milk bottles each and then put to bed in the stables grouped together according to size and cuddle up with each other and sleep through the night. The ex-orphans who have gone wild come in and visit the orphans. During our stay we experience so much; meeting baby Kandecha, new arrivals Orwa and Ziwa settling in, the antics of Wendi a naughty and cheeky young lady, Bongo who is so full of character strutting his stuff in front of the wild elephants, ex-orphans bringing in their babies, and Sabachi who went wild for 6 months and returns home for treatment as he is not feeling well. Being close and in the open with the wild elephants is another enchanting and humbling experience. 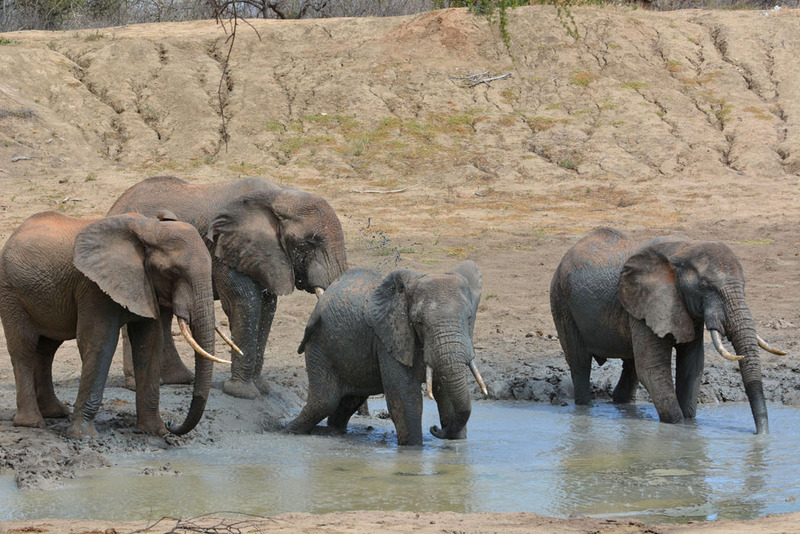 There is nothing between the wild elephants and us during their mud bath. The closer they approach the more majestic they become. 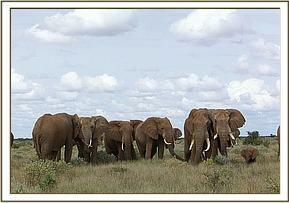 If you love elephants this is one trip of a lifetime worth saving for or a special add-on to your Kenya safari. Nowhere else in Africa or the world is this experience found. Wild elephants look on as Bongo the little orphan walks past. The tents under a thatched roof are simple but have a rustic and traditional African vibe. The outdoor bathroom and toilet are attached to the back of the tent and we love taking a shower alone in the wilderness under twinkling stars at night. The four tents share a two storey thatched building which provides the dining area, lounge and the upper area for relaxing and taking in the views of the surrounding bush. Martin out guide contacted Njagi beforehand to discuss our meal plan and ingredients for our shopping list and we brought our groceries from Nairobi. Njagi prepared the most delicious vegetarian meals from them. The camp is available to people who foster an elephant from The David Sheldrick Wildlife Trust. 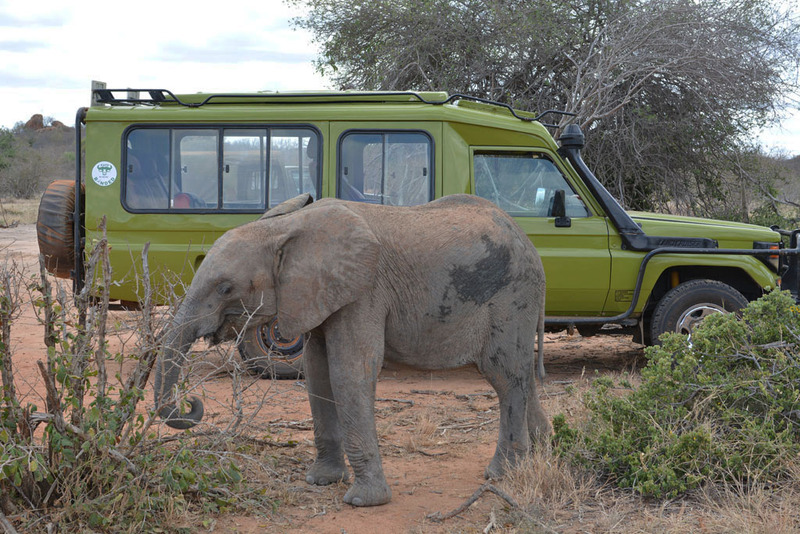 Ithumba is based in Tsavo National Park and about an 8 hours dusty drive from Nairobi. 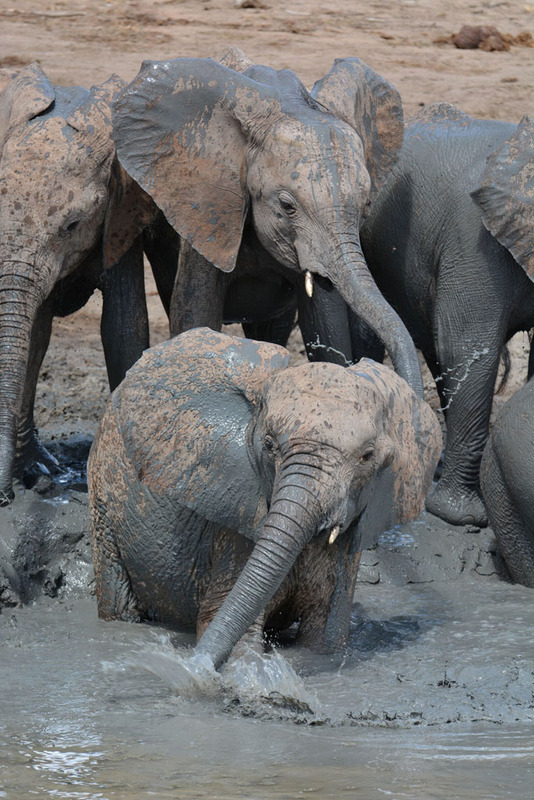 The anticipation of the mud bath and their obvious joy and delight is the best part of the day. The camp is booked exclusively for one set of guests at a time. The cost of $600 USD a night is for the entire camp which includes Njagi the cook and Issac the waiter. There are four tents, so up to eight people can stay at a time which makes it great value for a family group. The camp is self-catering and remote so you need to bring your own groceries, water and other drinks. If leaving Nairobi in the early morning, organise and arrange your grocery shopping at the supermarket the day before if possible. Organising transport to and from Ithumba and while at Ithumba is necessary. The ultimate way to do this is to have a guide accompany you or hire a vehicle. Safari drives are not available at Ithumba because the wildlife in the area is not used to humans. 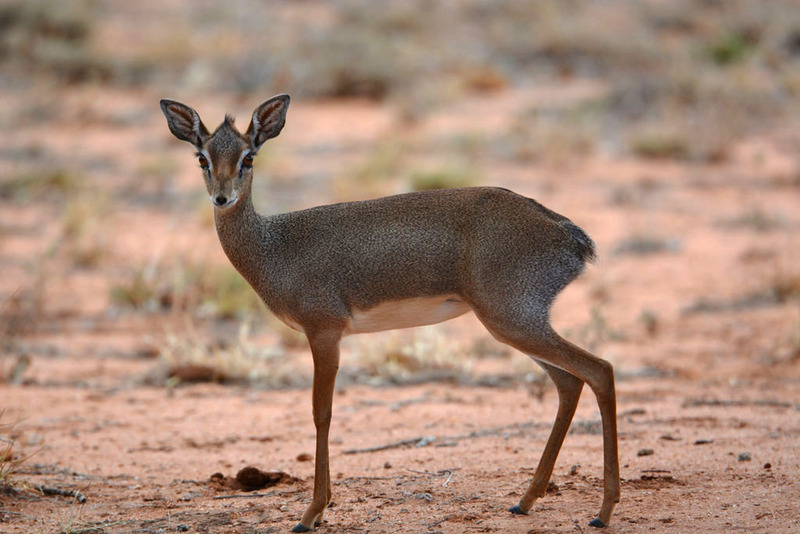 Wildlife and birds do come into the camp to drink such as Dik-Diks, Kenya’s smallest antelope who takes refuge around the camp and a genet cat is a regular visitor. While driving from our camp to the mud baths we did see some baboons and wild dogs along the road. Dik Diks find sanctuary at Ithumba. Two nights is definitely the minimum amount of time to stay, but three to four nights is best. If you can only spend two nights, on your last day try to stay for the mud bath before you leave. There is no wifi at Ithumba so take a few books and enjoy the elephants and tranquillity. Martin Maina from Nairobi Specialist is our guide and driver. Nowhere else in the world is this experience. Ithumba Camp US $1200 for an exclusive stay in camp. *Price for only the two of us, but this price is for up to eight people in a group. Vehicle Hire 3 days US $420 *Landcruiser Troopcarrier. Reduced cost for a smaller vehicle. 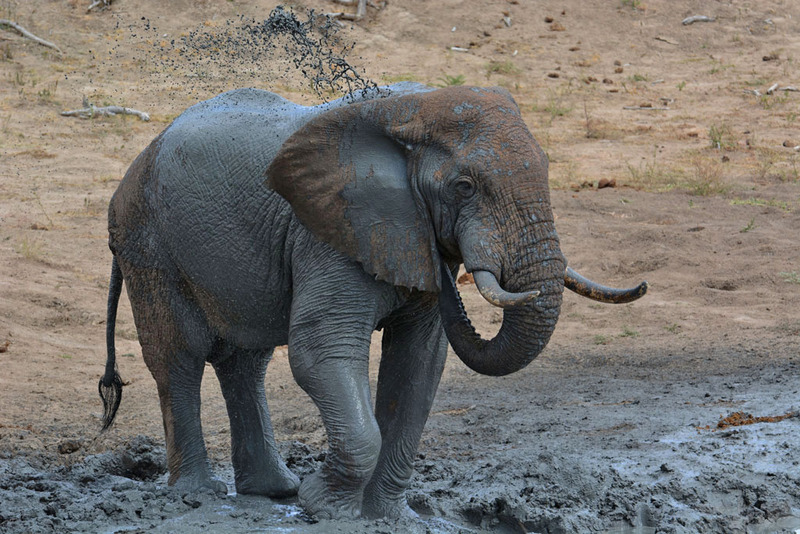 Wild elephant plays in the mud. Ithumba Hill Camp, a new and more luxurious camp with great views and a swimming pool is now also available for exclusive bookings to one lot of guests at a time. For more information contact The David Sheldrick Wildlife Trust. Love your photos ! 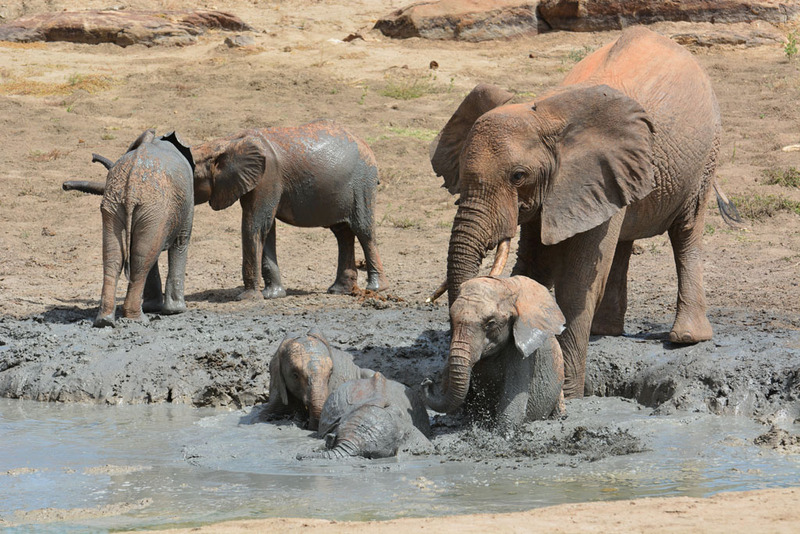 Mud bathing elephants captured beautifully with a great story of the orphans mixing with the others. Thanks for commenting and visiting our website Leigh. All I can say is WOW! We never knew this place even existed. It looks like an awesome experience and a great organisation. I love how there is no pressure on the babies to go back into the wild. Do you guys know if there is a certain amount of time you have to sponsor an Elephant before being able to stay here? Also for a family of three does the price stay the same? We would love to start planning this for next year. What a great experience! It sure is a great organisation Justin. It’s a fantastic atmosphere as the Elephants are so happy. They go out to the wild when they are ready, and once they go they can come back whenever they like. As long as you sponsor an Elephant, you can be a guest at Ithumba. There are no time restrictions. The above price would be the same for three people except maybe extra for food. Please note the park fees above are per person. Any more questions don’t hesitate to ask. Thanks for visiting our website and commenting. My name is Kim I am from Brisbane, Australia. Ray and Sue have kindly given me permission to post here. also, I was wondering if you would consider the possibility of teaming up to share the expenses of staying at the camp? If you are interested here is my email kada080@yahoo.com.au, to discuss further? ps: thank you Ray and Sue for telling the beautiful story of the elephants rehabilition back to where they belong in the wild, through your pictures and words. 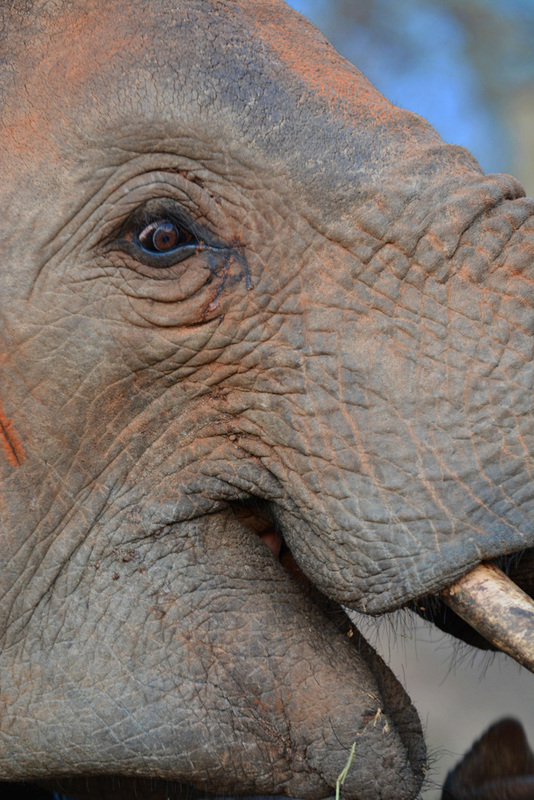 Thank you for sharing the story of your sponsored elephant. It is heartwarming to read of the work that these organisations do to protect and save these elephants. The beautiful images you captured on your trip compliment your report beautifully. Thank you for reading our story Vicky. It’s a heartwarming place and knowing the Elephants get another chance of being free makes it even more special. It’s easy to get beautiful images when you have a subject like this! Love looking at all the wonderful photos … it would be very sad if the next generations were not able to see these wonderful Elephants in their natural habitat. Thanks for your comment Diane. With organisations like the David Sheldrick Trust we have less chance of this happening thank goodness. 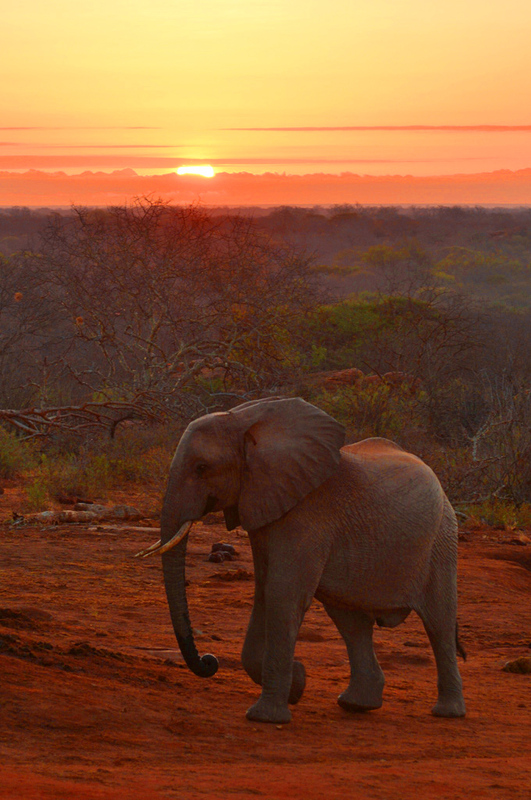 Wonderful and amazing photos of Ithumba! I had the good fortune to be staying there a couple of weeks before you. Altho the price seems expensive, it is incredibly worth it to have this close of access to the elephants! You’d be crazy to go to Kenya without staying here!!!! I can’t wait to go back. You are correct, I believe a minimum 2 night stay is best. We had only one night, and it was the best time of my whole month-long trip. I love seeing your fantastic photos of the mud bath! They didn’t go in the water/mud when we were there as it was too cold. Thank you for transporting me back to Ithumba!!!! Thanks Julie. We had wonderful and amazing subjects! Compared to a lot of those safari lodges it is really not that expensive. The once in a lifetime experience with the Elephants plus you also have the services of a great cook & waiter! That’s why at least 2 nights is the best. One day the Elephants didn’t go in the mud because it was overcast and cold. 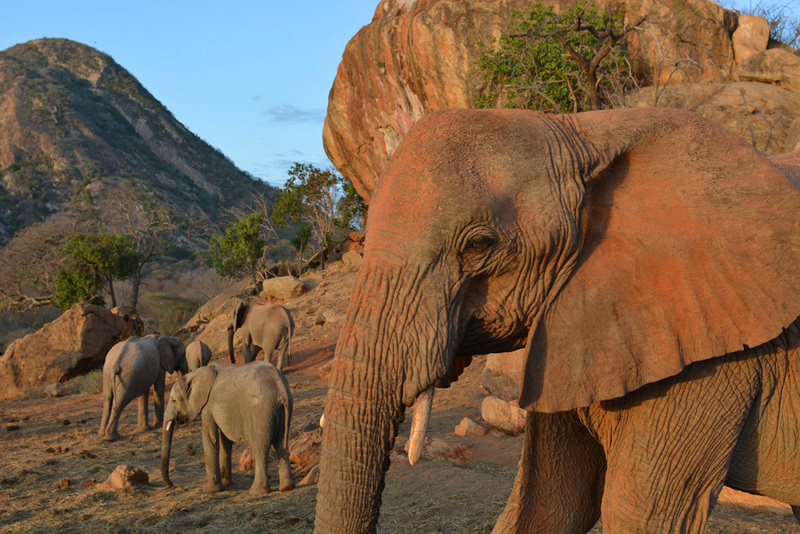 We are glad through our blog we took you back to Ithumba!! I just posted a reply under ‘Justins’ comment please read and if you are interested to visit in 2015 my email is there too. If your trip was later, definitely I’d be in. I know it’s very expensive to go, as only my sister and I went. We only went one night. Not because of the cost, but that was all it was available. It does book up very early at Ithumba, so I would suggest booking well in advance. It’s definitely worth scrimping on some other things in order to make Ithumba possible. I would be sure to hire Martin Maina @ Nairobi Specialists — you will be in excellent hands. He’s quite reasonably priced and definitely helps you make the most of your time. He assisted in my planning greatly — awesome suggestions from him and every one of them was excellent, from organizing the sights we wanted to see into the best format for time optimization. Incredibly honest and reliable. And Martin Maina is the best option for a guide. Incredibly knowledgeable and fantastic at organizing things for you before your arrival. Honest, reliable and a wonderful guide. We absolutely agree. Martin is the best!! Thank you for sharing with us. what a wonderful experience . Your photography is out on its own .I think you capture some of the most amazing sights & I feel that I’m there seeing it for myself. It looks like they have a really good set up .Must be a dream come true to be able to capture this in real life. Hi Di. Thanks for your comments. It was an amazing experience and one of those once in a lifetime expereinces that we will always remember. Love that tent! I’m envious of the whole trip. Who knew these places existed? Why am I not surprised to learn you adopted an elephant?! Your coverage of elephants is pretty phenomenal overall (in so many varied situations) but you’ve aced it this time. One could almost hear you clucking over your babies in their mud bath!) It’s beautiful. I’m pretty sure your efforts to inform the world of animal protection needs is well on its way to being legendary. Maybe the next Attenborough? Certainly of the same ilk. Thanks. Thanks Marie. The tent was rustic, but comfortable and it suited the environment. Ithumba is a hidden gem with not many people knowing about it. It is certainly one of those once in a lifetime experiences! Enjoyed reading your above report and browsing through such wonderful photographs. I foster five little elephants at DSWT, visited Kenya for the first time last November and again this past August. Barsilinga, Lemoyian and Oltaiyoni are still living at the Nairobi Nursery, Naipoki transferred to Voi the day after my visit to her last November, and Murera (plus her friend, Sonje) went to the new Kibwezi home at Umani in the Spring of this year. Thankfully, they are all doing well and are a great joy. I have a feeling Barsilinga will be the next of my elephant family to leave the Nursery, and possibly he will go to Ithumba. 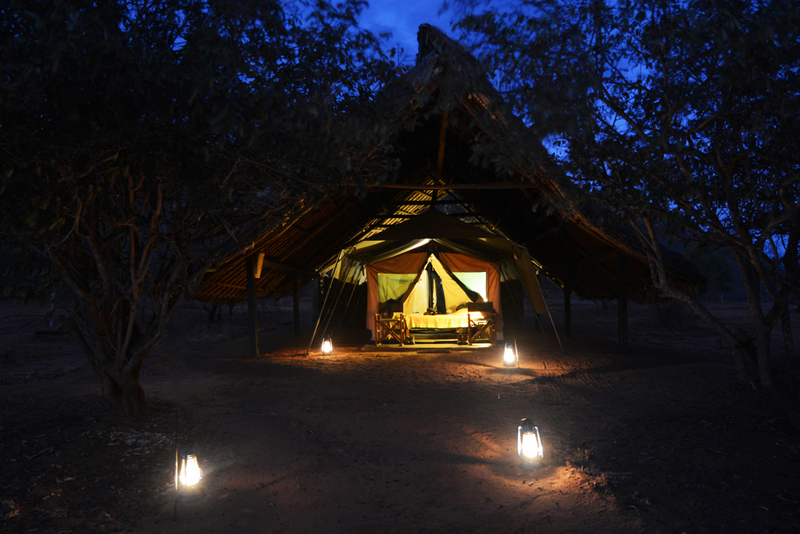 As a single traveller, my trips are always extremely expensive, but I must admit the tents at Ithumba look wonderful! Thanks so much for visiting and reading the blog Judith. Five Elephants! You are very special yourself, for doing that. We sponsor two but have been thinking lately to sponsor more. It really is a unique experience how you can meet and have close contact with the Elephants you sponsor. Ithumba is a great experience, and yes it is expensive if you are travelling on your own. We did have someone contact us, who is in the same position as yourself, and wanted to know if we knew anyone who wanted to share expenses at Ithumba. Please get in touch with us if this interests you. Once again thanks for your comment. These elephants are just adorable to watch! I haven’t seen one personally but I really look forward to seeing one in the future. Those pictures were nicely captured too by the way! Hope to see more content in your blog in the future. Cheers!